Question: Connection is attained by the total annulment of each individual to complete zero. But what is the difference between this and ordinary psychology? Answer: The difference is very simple: before whom do we annul ourselves? I annul myself before the others and they annul themselves before me, and what’s next? This is the condition only to reveal the force of the Light. The self-annulment of everyone before everyone else creates a neutral spot in the center of the circle in which no egoistic forces operate. It is the spot of our mutual general desire, since there we connect and neutralize our ego. We establish the new reality in this spot, a new space in which we discover the upper force. 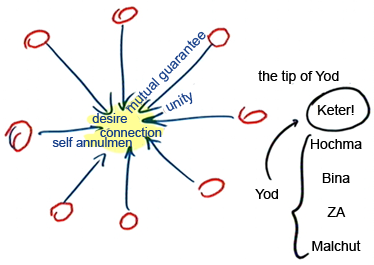 All our desires are focused on the center of the circle in which there is the force of the desire, connection, self-annulment, unity, and mutual guarantee. On the one hand, it is said that there is no empty space and that there is always a certain quality, a certain force. But here in the center, there is nothing. A place is called desire. Here our collective desire is concentrated, but it is as if it is annulled, since none of us wants to use his own desire, and only wants to bestow upon others. Thus we create a special new place in a different dimension, on a different height. We start from Malchut, and then Zeir Anpin, Bina, Hochma, until we reach Keter, the tip of Yod. This means that out of ten efforts that we made (Yod means the number 10 in Hebrew), we reach the tip of Yod, in which the Creator is revealed. This is the essence of the center of the group, in which we build a new space, a new dimension with special attributes by our efforts and our annulment. This is where the upper force can be revealed. So only after the shattering and the correction do we receive a means, a vessel, in which the Creator is revealed. Otherwise it is impossible to reveal Him since we don’t have a sensor to detect Him, no natural sense to feel Him. He appears only when we stabilize Him this way: We are all egoists, but we want to rise above our ego and annul ourselves before everyone else. We want all that in order to resemble the Creator; we want to acquire His form and His attributes in order to resemble Him. Thus we create a new state in the center of the group called a womb, Shechina. Only by our mutual annulment can we create the new space with the new attributes in a new dimension that didn’t exist before in Malchut of Ein Sof (Infinity). This place for the revelation of the Creator appears only now thanks to our efforts.